Banner ads is one of the ways to earn with your dating site, and/or to advertise partner services. 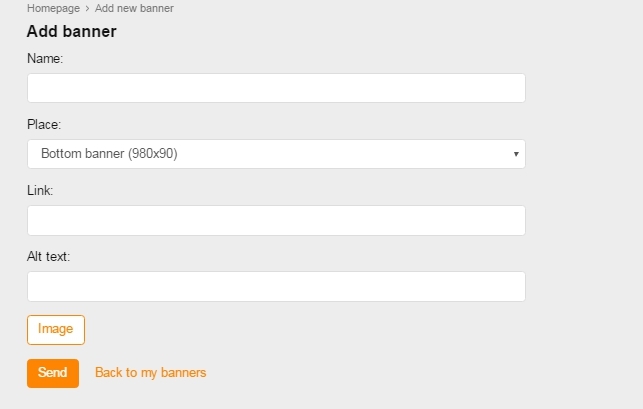 All banners of your site are listed in the Banner ads section (/admin/banners/index/). The following statistics are available for each of the banner ads: number of clicks, views daily, weekly, monthly, yearly. In the form that opens, write its name, choose place. Note that banner places are fixed in the system. Then choose banner type (HTML or image). To add an image banner, insert a link where it will point (if needed), create Alt text that will be visible upon mouse over, limit number of clicks and number of views, apply some other settings and upload the image. Note that the image size should be as close to to the banner size as possible for best display. All site pages are divided into groups. 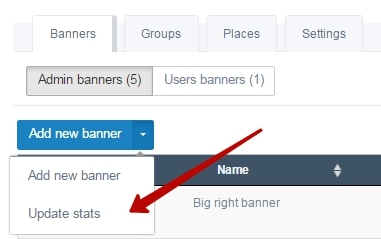 The pages that are visited more often than others can cost more to post banners on. The setting applies to user banners. To edit the cost, click Edit group, set up the price and save the changes. 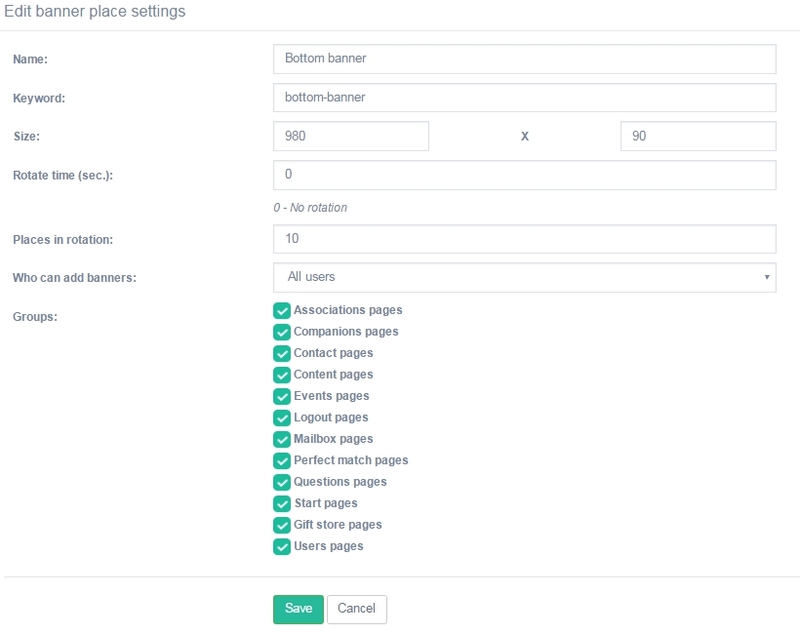 Places editor shows you banner positions on a page. You can set up rotation time, amount of places in rotation and groups of pages for each position/place. Period stands for activity period of each banner, while email notifications will inform you when there is a new banner uploaded by a site member and awaiting moderation. To post a banner, one needs to give it a name, select a place, insert link and alt text, and upload the image. After the changes are saved, the banner is sent for approval. The site administrator reviews banners in the admin panel in section Banner ads > Banners > Users banners (/admin/banners/index/user). 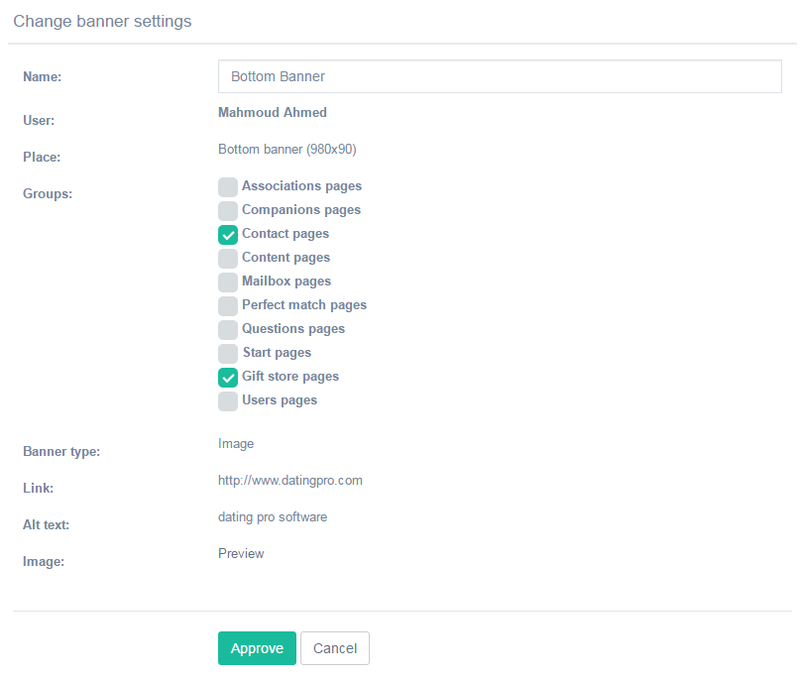 To approve a banner, click Edit banner, choose group(s) of pages where you want to allow this banner to be displayed, and click Approve. After that the site user can select which of the groups of pages s/he wants to display the banner on, and make a payment to make the banner active on the site.